Adding insult to injury, in 2001, Bush promised that he would pay off the federal debt within 10 years. 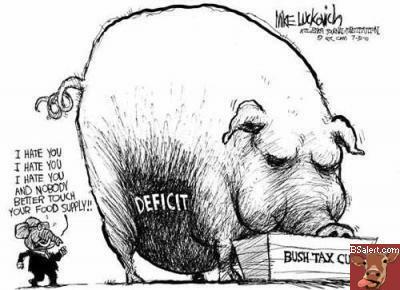 Seriously, cutting taxes causes deficits?! Is this really a critical thinking website? It's obviously SPENDING that is the issue because the government always wastes. It is the spending that is the big pig at the trough! Spending other peoples money that is taken by the threat of force via the IRS. Focus on the deficit is a red herring since the deficit = revenue - spending. A corrupt government shouldn't have any revenue. Do you want anyone to further fund (i.e. 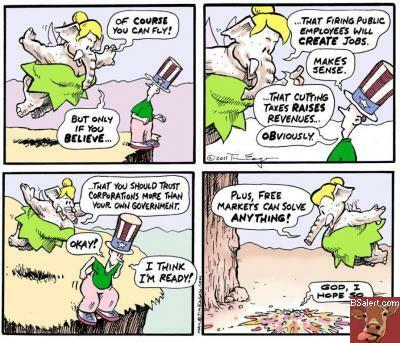 pay higher taxes) to a bureaucracy that wastes and wastes and wastes? It is not in your best interest. does not show how 1999 and 2000 were no calculated correctly and did not have the massive surplus the government claimed. government then went on to project the next 10 years budgets assuming revenue would increase yet no increases in the budget spending. also does not show the revenue increase after the tax cuts...the revenue increase sustained until 2007, too bad spending out paced the revenues by and average of 200 billion dollars during Bush's administration...too bad spending out paced revenues by 1500 billion during each of Obama's years in office. It was the Congressional Budget Office that predicted a trillion dollar surplus over the next ten years when Pres. Bush II took the Presidency in 2000 from Al Gore. It is absurd to think that the CBO did not expect budget increases. What it did not expect was the repeal of the Clinton agreement: no new programs without paying for them. Bush violated that pledge and with the advent of Gulf War II he created a massive debt. And the Obama deficits were created to offset the debacle in the Banking, Insurance and Investment industries, so that the economy would not go into a depression. It was necessary because all financial commerce had stopped and without US government intervention, the dominoes of Wall Street would cause many major companies to claim bankrupcy. Remember General Motors that lost Pontiac and Oldsmobile? And Chrysler was sold at desperate prices. And retail stores dropped like dead flies. Remember Circuit City, Linens and Things, and Home Depot's Expo? Gone! As well as thousands of other small retail shops in those strip shopping centers. Huge Malls have lost major tenants. And it would have been worse had not the Federal Government stepped up to save the banks and other financial institutions, such as Goldman Sachs. So,let's compare apples to apples and oranges to oranges. Obama's debts were created to prevent total collapse. Bush's debts were created to stop Democrats from giving more to poor people whenever they resumed power. It's worked so well that those who were sick and poor and marginal in 2000 have even less resources for living a low standard of materiality now, including less money for colleges and universities, less money for roads and bridges repairs, and less money for social programs, such as education and training. And that's the way the huge budget deficits have caused major reductions after inflation on good government programs which promote economic growth, price stability and job creation.